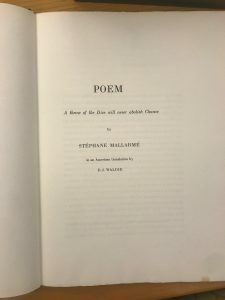 One of the books housed in the Trinity’ Watkinson Library is A throw of the dice will never abolish chance, by Stéphane Mallarmé, an important figure in symbolist poetry. Mallarme seems to be concerned about the human reaction to the destruction or the downfall of the belief in the old G-d and the legacies thereof, in the era of industrial revolution and modernity. The crisis in belief, symbolized by the “shipwreck” on the first page (line 5) prompted the poet to speak more. This printed edition, by Greenhouse Review Press, comes in a delicate box, with a plain dark purple leather hardcover. The paper on which the poem is printed is Umbria, handmade in Italy by the Fabriano Mill. The foredges are left undecorated. 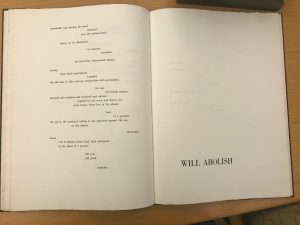 Pastedowns and end leaves are made from the exact same paper as the text block. listening to the poet softly hum the words with much cadence, varying speed, emphasis and emotion. 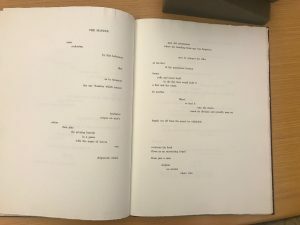 The poem, going from upper left to bottom right, hastens and/or decelerates its pace according to the font and the length of each line. One might also say that the poem is presented like a silent movie with nothing but subtitles, yet one can almost hear the prelude to modernism and the death of G-d. “The Master” , whose “legacy” is “vanishing” upon the rise of the new concepts from non-existent religions brought by the industrial revolution in terms of technology, way of life and philosophy, will tremble and collapse (page 5). The poem challenged my way of thinking not only in terms of the relationship between humanities and G-d, but also the power residing in each individual, as we are all capable to make an impact in the complicated net of global butterfly effect and domino effect, predicted by Mallarme long before those terms were even invented. Among the streams of seemingly bleak, orderless words, a beacon of hope is revealed, as any person, any action, and any thought, “expresses a throw of the dice,” which makes a difference.